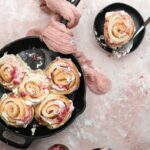 Recipe for Strawberry Rhubarb Sweet Rolls, a springtime southern pie flavored take on a cinnamon roll. Fresh strawberries rhubarb preserves add a sweet zing to the cream cheese frosting. Combine all ingredients in blender or Nutribullet. Blend on high until liquid. Pour into glass mason jar and set in fridge over night to thicken. In a bowl of stand mixer, combine yeast, 1 Tbsp of the sugar, and warm almond milk. Let rest for 5-10 min or until foamy. Meanwhile sift your all purpose flour into a separate bowl and whish in salt. Next add in eggs, unsalted butter, and remaining sugar. Mix on medium low speed with paddle attachment. Slowly spoon in flour until a consistent dough is formed. May need to scrape sides of bowl and across bottom with spatula to incorporate all ingredients. Switch to dough hook and beat for 5-6 min or hand knead dough for 8-10 min. Place dough in lightly oiled bowl or container and cover with plastic wrap. Set in a warm draft free space and let rise until doubled in size. Usually this takes 45 min to an hour. Place dough on a well floured surface and roll into roughly a 12 X 15-inch rectangle. Take your jar of strawberry rhubarb preserves and gently spread a thin layer across the dough leaving a small border around the edges. If you over do you preserves, it will all squeeze out when rolling and cutting. Next roll your dough inwardly and lengthwise. Cut into 12 small slices for small rolls or 6 slices for jumbo rolls! Arrange rolls into greased baking 9 x 13 in pan or cast iron skillet. Make sure pan is large enough to fit rolls, if there are too many packed tightly in a small pan they will have a hard time baking through the center. Cover with a thin towel and allow to rest and puff for an additional 30 minutes. While rolls are puffing preheat oven to 375 F.
Bake for 20-21 minutes or until center reaches 190 F.
While rolls are baking make your frosting!!! Clean your stand mixer bowl. Add butter and cream cheese and whip with the whisk attachment at medium speed until blended. Take a spatula and push through the whisk if getting stuck. Next add vanilla and powdered sugar. Blend on low speed until the powdered sugar is just combined. Then add strawberry rhubarb preserves if you decide, and increase speed to medium until reach desired thickness. Add more powdered sugar as needed. Once rolls are cooked, remove from oven, slather on frosting and eat warm! !